Weaver is currently doing the finishing touches for its largest build to date the 97 Enclosed Sportfish, which over sizes the 87 launched in 2013, and the 80. Constructed as all Weaver in cold molding with the jig method, the new Weaver flagship was christened 18 Reeler and features a four guest cabin lower deck, with a spacious midships owners stateroom featuring two view portholes to both sides. 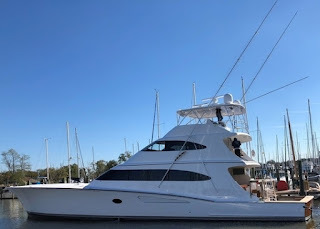 The main deck features a one step split level layout with the fore area featuring dining and galley, and the entrance being the relaxed area with a spacious C-shaped couch. The Weaver 97 Enclosed Bridge is powered by twin MTU 2600hp.